Which flavor of Chevy V8 do they recommend? In my personal opinion the old, familiar, small block Chevy engine has no business in any little British sports car. Too heavy, and physically too large. (Also, not esoteric enough for the bigger British sporty cars.) Leave those engines to the muscle car and old school hot rod crowds. Some of the LS variants are exciting, but they'll be difficult to install in an Alpine. Small block Ford is a good choice. I'd prefer it unstroked and with a very lightweight flywheel. He was talking LS.. Says it's cheap/more HP/smaller than the Ford.. I'm leaning heavily to the 302 with a stroker kit. I'd like to top 300Hp. The LS will be the best choice if it will fit. Hands down there is no cheaper, easier way to make power, and it is smooth and reliable. But will it fit? And what about the headers? For an Alpine, the SBF is the accepted standard of course. Can't really go wrong there. BTW Curtis, isn't the SBC physically a bit smaller than the SBF? Go with the Ford small block as it will be easier to fit. Another reason to stay with the Ford small block is that if you ever have to sell the car it will be an easier sell with the Ford engine. An Alpine with a Ford drivetrain is more desirable as it is much closer to the Tiger than an Alpine with a GM drive train. Tigers are becoming very pricey so I would try and keep the car as close to a Tiger if I could. Jim asked: "isn't the SBC physically a bit smaller than the SBF?" I concede I don't know the measurements, but I perceive SBC as significantly longer front-to-back due to its distributor position. Putting an SBC where this SBF is would probably require rethinking the hood latch and nearby sheetmetal. Old style SBC is longer, wider, taller and heavier than SBF. LS is about same weight and size as SBF. You'd think it would be lighter with aluminum block. Edited 2 time(s). Last edit at 10/31/2016 06:44AM by mgb260. The dimension info on the web is all over the place so the only way to really tell is to do an actual measurement. Most measurements I saw on a search included the exhaust manifolds on width, the air cleaner on height, and the water pump on length. As we know those items add flex to the dimensions so those measurements aren't that much help. Also of course the SBC can be fitted with a crank trigger ignition to solve the issue with the rear distributor. But I agree that the weight of the SBC is the real issue. The LS, the SBF and the SBB are all better choices for most LBC swaps. Of course that LS equipped Alpine did look and sound sweet. When swapping engines into an Alpine, dimensions are not as important as shape. The engine bay is really convoluted. Unless of course, you are willing to remanufacture the entire engine compartment. Thanks for the debate! My guy is talking a LS-3. I found one online that put one in an Alpine.. Pretty bad to the bone..
LS3 is the shortest of the LS variants I believe so good choice if you go LS. From my perspective (which doesn't really matter because it's your car) the choice is simple -- SBF is the nostalgic answer. Probably brings a little bit of easier resale if that's a consideration. LS is the go to choice for most any new swap these days. As noted above, cheap power. But it'll come at a fabrication cost as headers and other conversion bits are not likely to be readily available. If I were doing my MG again, I'd be putting an LS in it. If you haven't already, do your research on traction. 300 rear wheel HP isn't likely to hook up w/o more work. Bottom line, nothing "fits" into an Alpine and aftermarket parts are not much help. 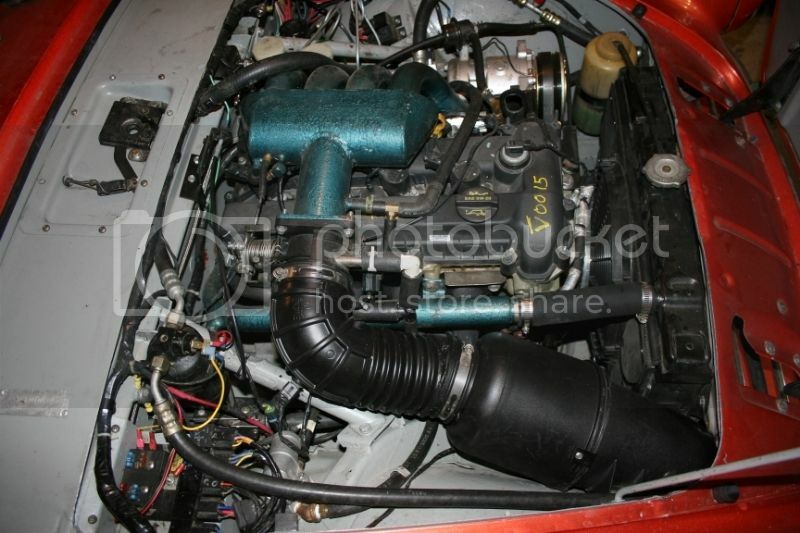 You either fabricate everything to fit the engine into the car or rebuild the car to fit the engine. 2010 Ford Fusion 2.5 Duratec with parts fabricated to fit the engine into the car. The purpose of my previous post was to drive home the thought that installing almost any engine into an Alpine is not a trivial undertaking. This is especially true with an offbeat (non SBF or Ford 2.8) when done by a pro. A couple of years ago, I was talking to one of my wife's cousins at a family function. He happens to work at a car fabrication shop in Indy and showed me a magazine which had one of his projects on the cover. Beautiful repowered Ford truck. I showed him my car and asked how much (very approximately) how much it would cost to have the installation done in their shop to their standards. At first look, he said $15,000. Then the price started to go up. After much looking and digesting everything that had to be done, he finally settled on "about $25,000" if I supplied the "big parts". For comparison, he said they do a lot of SBC into American cars for about $15,000. So a guy that is used to working on American Iron could get in way over his head (cost wise) pretty quickly. Edited 1 time(s). Last edit at 12/07/2016 11:46AM by Orange Alpine. Pretty sure Rob meant the LS4. It is the most compact as it was built for transverse orientation. If 300hp is the goal, then the LS3 will overshoot that by quite a bit. 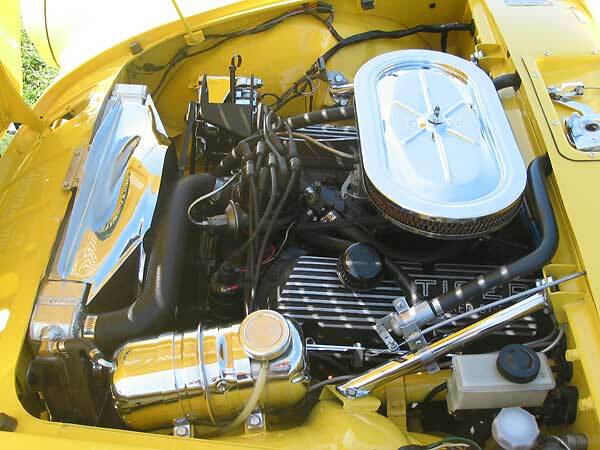 The LS3 is 376ci rated at a conservative 430hp. It can easily be bumped into the mid 500hp range with a cam change. Yes, the Alpine would be a challenge. Yet it has been done a few times. Seems both the front suspension and the steering are somewhat problematical, so how about this thought: If cost isn't too great a consideration, how hard would it be to fit a Fast Cars IFS to the body? Expensive yes, but it could sort things out rather nicely I would think. If that's too much money, possibly the MGB front suspension could be adapted. It was used in the Arntz-Butler Cobra and some other cars as well. The main issue would be allowing space for the shock absorbers (upper unequal length control arms). These are a couple of outside the box ideas but the two cars are of similar size, weight, and configuration so it could be worth considering. on the inside facing the radiator if tire clearance might be an issue ! The RaceShop started on my Alpine.. I don't have a shop/room/time to build it. I've decided to go all out HP wise.. Not sure how high we will go, but am leaning toward the LS engine, though FORD is the nostalgic choice, almost NOTHING under the car is stock, so makes less sense to force the FORD at the expense of Horse Power. I would prefer speed and weight. We're going to build a Street Legal car capable of racing, at least that's the idea. I'll get some pics if anyone is interested. John, We are always interested. Please post lots of photos so we can see this project unfold. What shop is going to do your car?